When I wrote the post on Allowance I promised a separate post about chores, so here it is. There are different ways to structure your family chores, but the most important thing is that children have chores. Children need to participate in family work to learn responsibility, a good work ethic, and what it means to contribute to the greater good. As I said in the Allowance post, there are benefits and responsibilities to being part of a family, and chores are some of the responsibilities. When you first introduce a chore system or add new chores for children, they will complain and resist. (See post on Resistance to Change.) But if you stick to it (kindly), they will get used to that new system. If you put in the effort to teach your children to work hard and be responsible from the time they are young, it will pay off. Your life will be much easier! The other day I had to vacuum some rooms because my daughter was sick and couldn’t do her chores. It occurred to me that I almost never vacuum! I also rarely do the dinner dishes. My children are old enough now that they are able to take turns doing them every night. I am very thankful that we have been consistent in requiring our children to help out at home. 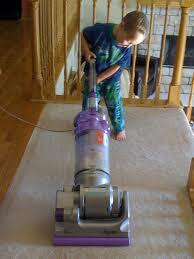 For children ages 3-8, the purposes of having chores are more to practice working and to get into a habit of helping. Don’t expect too much of a young child, or you’re going to be continually frustrated. Their efforts are about the process rather than the product. Read the post Go Clean Your Room! for more on this. It is important that you still have chores for young children, but don’t get into a control battle over them, and don’t fret if they are not done well or independently. It’s hard to wait until children are 8, but that really is the “age of accountability.” That is when children start to understand and care about right and wrong, and have the cognitive and physical abilities to be helpful and responsible. The two most important elements in family chores are that children have them and that they are expected to do them week to week. Their exact chores and when they do them can vary from family to family. A good system is to have a set of daily chores and a set of weekly chores (usually done on Saturday). For children 3-10 their daily morning “chores” will include getting dressed and brushing their hair and teeth, as well as making their bed (to their ability) and possibly a dish chore (unloading the dishwasher for the younger ones or rinsing breakfast dishes for older ones). Their chores need to fit their age and abilities, and can increase in difficulty year to year. Their chores also need to fit your schedule. For our children, middle school and high school start much earlier than elementary, so when the kids reach that age they don’t have morning chores anymore (besides getting themselves ready), but after school they are expected to load the dishes, and they rotate doing the dinner dishes. Additional dish chores might include setting or clearing the table. On Saturdays we do the bigger, house-cleaning chores that take a little longer. Cleaning bathrooms, vacuuming, dusting, and cleaning their own bedrooms are some of the chores assigned on Saturdays. It works best if assignments are clear and consistent; then there is no question about who is responsible for what. As children’s abilities change over time so do their responsibilities. 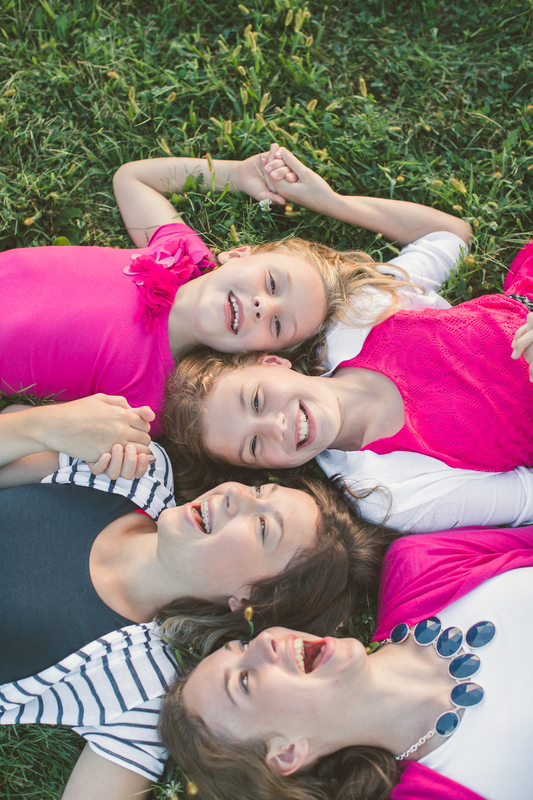 We’ve found it works well to reassess every fall, before school starts, and create a new chore schedule. We take into consideration the children’s increasing abilities but also their school work load and activity schedule. We write out a schedule for both the daily and weekly expectations. We present the new system at a family meeting and listen to any feedback they might have. This new schedule for the school year can also include assigned days for helping with dinner preparation and instrument practicing schedules. Once you’re in a good habit, the regular daily and weekly chores will go pretty smoothly. But when there are extra chores, you’re sure to still get resistance! Periodically I decide the house needs some deep cleaning. I try to warn the kids when this is coming up, and give them a pep talk reminding them that when everyone helps the work is more enjoyable and it goes faster. We talk about how nice the house will look when it’s all clean. Sometimes I assign the chores, and sometimes we write them on slips of paper and choose out of a jar. Another way is to tell them the options and let them choose, but this can lead to arguments between the children, so you have to be careful. In the summer we stick to the same daily and weekly chore schedule, but we add on some extra responsibilities. Kids have more free time in the summer, and it’s a great time to teach extra skills such as laundry or sweeping and mopping the kitchen floor. This is also a good time to pick a few days for all family members to help with deep cleaning the house. Again, I present the new chores and schedule to the kids at the beginning of summer. The particulars of the system aren’t as important as sticking to it and requiring all children to work. The past few summers I’ve had a “special helper” assigned each week. That daughter helps me deep clean the kitchen, do the laundry, grocery shop, and plan and prepare the meals. It has worked really well because it’s easy to remember who to call on for help, it’s fun to spend time with that daughter during the week, and she enjoys the extra attention. I teach her specific things about how to do all the chores, and it makes life easier for me! I’ve had two friends recently suggest I do a post on allowance and chores. One even gave me a list of questions she hoped I would answer, so I decided to do this post in a Q&A format. Do you give your children allowance? Yes, we give allowance because it enables them to learn money management. By practicing with their own money, children can try out concepts – saving for a rainy day, prioritizing goals, and delaying gratification – that might otherwise seem abstract or irrelevant. 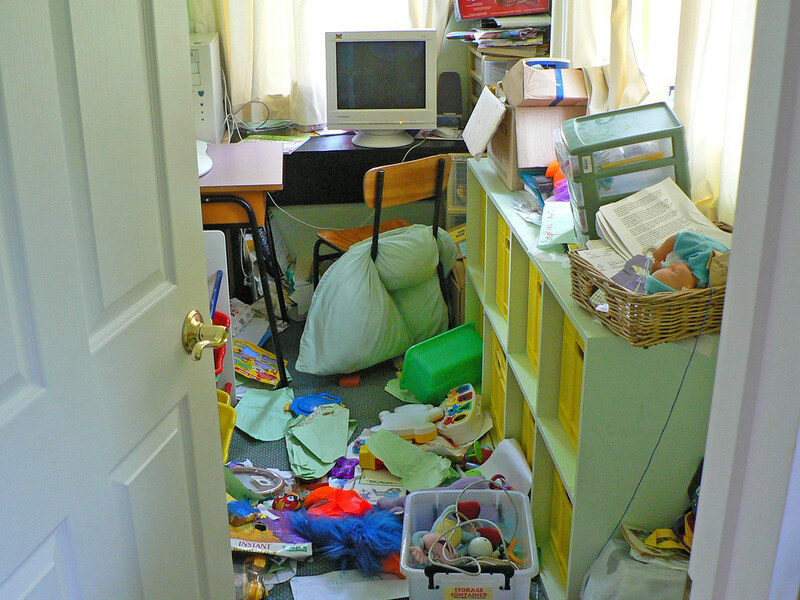 Allowances give kids room to make mistakes in a low-risk environment. They are able to learn early on the pitfalls of impulse buying and the value of saving. When do you start and how much do you pay? We start giving allowance when our children enter kindergarten. A child’s understanding of the concept and value of money does not fully emerge until 6 years old or older. Before then you will find him or her leaving the money around, not taking care of or caring much about it (beyond an initial excitement). We pay $1/grade/week. For kindergarten and first grade they get $1/week, in second grade $2/week, and so on. This amount has worked well for our children, and it’s an easy way to remember when they get a “raise” in allowance. 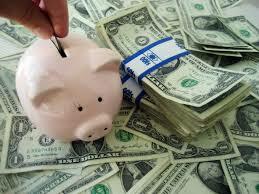 We decided to give out allowance on a weekly basis, although biweekly or monthly can work also. The important thing is getting in a consistent pattern so you remember to do it. It takes some effort to have the correct change around each week; you need many one dollar bills! Do you force your child to save or give to charity? This is a tricky question because if the point of giving allowance is to let children learn money management, shouldn’t they be permitted to spend it however they want? The answer is yes, and no. We don’t force our children to save any of their money. Their allowance is not that much to start with, and I don’t think any amount they could save would make much difference in long term pursuits (college, etc.). Some of our girls have chosen to save up for some big-ticket item, which has taught them about delaying gratification and the benefits of saving. But if they choose to spend it all right away, I’m okay with that. We do, however, strongly encourage them to donate money. In our church (the Church of Jesus Christ of Latter-day Saints, or the Mormons), we are taught to donate 10% of our money as tithing. Ten percent can be tricky, though, when you’re paying $2 a week! I didn’t like the idea of giving allowance in coins, so I came up with a better way. I keep track of the weeks and have my girls pay their whole allowance as tithing every tenth week. It’s the same concept, one-tenth of your increase, but more convenient! Sometimes the girls have resisted and said they don’t want to, or it’s their money, but I just say, “This is what Hoelzers do!” and give them the pen to fill out the tithing slip. I remind them that the other 9 weeks they got to keep their whole allowance, and that this one week their money can go to help others. Some families have their children divide up their allowance into spending, saving, and charity jars. This is a great idea if you have the small change on hand and the patience to keep up with this system. It was too much for me to keep track of, and I felt good about letting them spend the money, after they had paid tithing. Somewhere in middle school my girls started making more money from babysitting, keeping track of their own income, and paying tithing on it on their own. Do you monitor what they spend their allowance on? This question goes along with the previous one, both relating to children’s freedom to choose what to do with their allowance. Again, we give allowance because it is an educational tool, to help them learn lessons about what and how they spend money, so we don’t monitor very closely. But I do think there can be some general oversight, such as, “You can spend your allowance however you like, as long as it doesn’t cause a problem.” Buying something you’re opposed to, like fireworks or a pellet gun, would fall under that clause. In general you should let children spend their money on what they want, even if you don’t think it’s a good use of money or worthwhile. 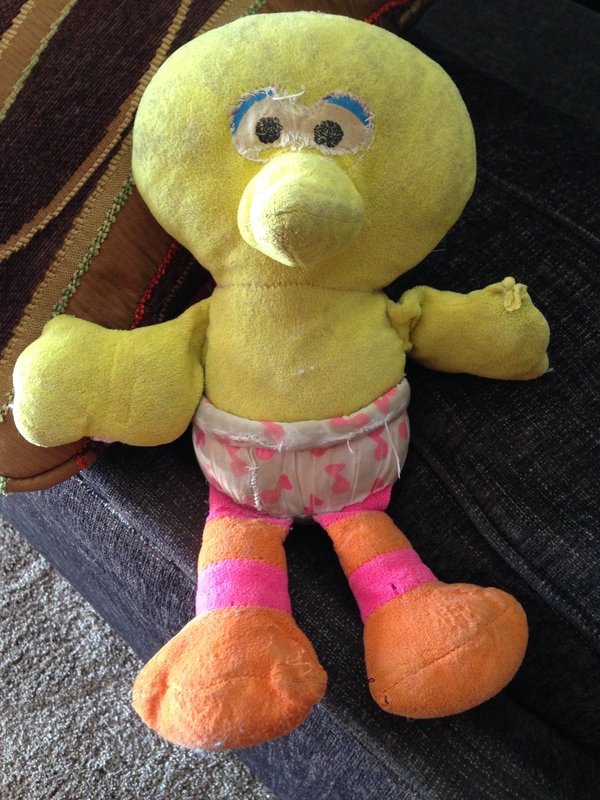 I’ve had times where my child has bought something of low quality that I knew would break, but I didn’t say anything. When we got home and it broke, I didn’t say, “I knew that would happen;” I was sympathetic and kind and told the child I was sorry that happened. The child learned the lesson from the consequences far more powerfully than my predicting the consequences. When my oldest two daughters were in middle school we decided to sell much of their accumulated American Girl dolls and clothes. The sale was a success, and they both earned hundreds of dollars. One child asked if she could open a savings account (and the money is still in that account to this day). The other got on amazon.com (with which she was already intimately familiar) and spent almost all of it! Both approaches were acceptable to me, and both girls learned lessons from the experience. Do you allow your children to borrow against or get advances on their allowance? I’m against this, more because of the inconvenience than any strong philosophical stance. It’s too hard to remember who borrowed what or how much they still get on Saturday. I also think it’s a bad habit to get into. The Hoelzer Family Bank doesn’t give advances. I want my children to learn to delay their gratification and not spend their money before they have it. A related problem is when they want to buy something at the store, but their money is at home. I mostly allow this. I will buy the item and have them pay me back when they get home. It’s one more thing to remember, but it’s a little more immediate. What are your children responsible for paying for themselves? Between the ages of 6 and 12 their allowance is pretty much just fun money. I pay for their movies or activities, and they don’t really go places that cost money with friends. They could use their allowance for toys or trinkets, food or candy, or save up for something bigger. Around middle school, children’s expenses increase. This is the time they want to do stuff with friends and want more clothes and accessories (at least girls do!). At that point we started having them pay for some of their own fun activities, but not all. We didn’t have an exact plan, but if I knew they had some money (if they were “cashy,” as I call it), then I would tell them to pay. When my girls were in eighth grade I started having them pay for their dance clothes and shoes. There is a large price difference in leotards, and if I am buying, they really like the more expensive ones! Having them pay for their own leotards taught them a lot about the value of a dollar and how to look for sales and discount websites. One fun thing about children having their own money is watching them use it to buy for others. For Christmas and birthdays we encourage our children to buy presents for others family members. It has been really cute to see their generosity and excitement over finding a present to give to mom or dad or sister. At Christmas we take them shopping to buy for others. 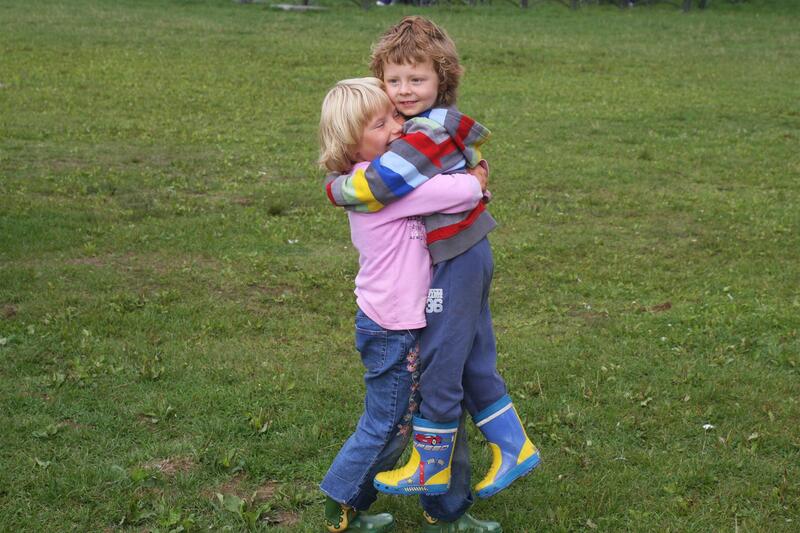 We supplement the younger ones’ allowance so they can buy for everyone and sometimes a friend or two. But the older ones (10 years old and up) budget and decide what to get each person and pay for it all themselves. They are very thoughtful in gift giving, especially for my husband and me. Around November if they are talking about things they want to buy with their allowance I remind them that the holidays are coming and they should be saving. They have really come to enjoy this opportunity to give. Do you link allowance directly with chores? This is the question you’ve all been waiting for. This is a topic that many people feel strongly about on both sides. In our family we do NOT link allowance with chores. Most, if not all, of the parenting and financial experts I have read or heard have recommended separating the two, for the reasons I mention here. We talk a lot to our children about family responsibilities and family benefits. We tie that in to family unity by saying, “Being part of the Hoelzer family comes with benefits and responsibilities. One of your benefits is receiving allowance each week. One of your responsibilities is doing family chores.” We use this concept in other ways, also. If we are going on a vacation, that’s a family benefit. If there are extra chores to do some weekend, that’s a family responsibility. We all work together for the good of the family, and we all enjoy certain benefits. If another family gets something our family doesn’t, we point out that every family has benefits and responsibilities, and that’s not one of ours. Again, giving children money is an instructive tool that helps them learn and develop necessary skills for adulthood. It is given simply because they are part of the family. The main argument for tying chores to money is this: “Children need to learn that if you don’t work, you don’t earn anything. I don’t get paid if I don’t work, so they shouldn’t either. That’s how the real world works.” I completely disagree with the premise of this claim. Correlating chores and allowance seems to make sense on the surface, but it’s actually quite arbitrary. That same reasoning could be used to say, “Nobody pays for my vacation, why should my child get a free vacation?” or “I had to pay for this food we eat, why should my child eat for free?” When extended to these situations you can see that the logic starts to break down. Adults have to pay for everything they use or consume. And we have to work for all the money we earn. But childhood is a special time where things are provided for you so you can grow and learn. It is essential that a child learns to work during childhood, and that’s where the family responsibilities come in. Children need to have chores and responsibilities around the house. They need to experience what being a family member, a team member, is all about. It’s important to teach them that all family members have responsibilities to the group. And that’s nonnegotiable. Though they may gripe about doing the dishes, the need to contribute in a meaningful way is fundamental. Tying that work to allowance doesn’t give the child a better work ethic. Sometimes it can even cause the opposite – the child can consider whether the chore is worth the money, and possibly decide it’s not. In that case, he doesn’t learn to work and he doesn’t have any money to spend. I don’t think there is any child who will grow up thinking that money comes for free forever. This is just not a legitimate concern. If you instill a good work ethic in your child he will continue to work hard at whatever his current task is: family chores, school work, college work, or his professional job. Children are smart enough to realize the difference between a weekly allowance from mom and dad and money they will need to earn as an adult. Connecting money and chores can give both an added layer of emotional power. Parents start to emphasize that you have to get the bad stuff over with (the chores) to get to the good stuff. I prefer to teach both as positive concepts. We get to work together and produce a clean house, and we also get weekly allowance. Sometimes parents want to tie chores to allowance because they feel it gives them more leverage. They have something to hold over the child’s head to motivate him to work. But, again, it may not be motivation enough, and then you are stuck with undone chores. The better way to get children to complete their chores is harder and takes more time: talk to them about the importance of all family members pitching in, compliment them when they complete their chores, stay with them to ensure they are done, be firm but kind in insisting the work is done. Do you have any chores tied to money? We do have a list of “money chores” that the kids can choose to complete if they want to earn extra money. These would be the more difficult, extra chores such as cleaning windows or vacuuming the car; something that is not part of the child’s usual responsibilities. They are completely optional, simply there if the child wants to earn money. We haven’t been great about keeping this list up, but if a child is saving for something special and wants ways to earn extra money, then we will create a new list. *Look for a future post for more about family chores and responsibilities. *Some of the information in this post came from babycenter.com. Many people ask me what parenting books I recommend, so I thought I’d write a post summarizing the books I like and why I like them. I have joked that parenting books are more a cause of frustration than a help (see Here and Here). But really, I do like to read parenting books and see what suggestions they can give. And I wouldn’t be as knowledgeable or parent in the way I do if I hadn’t kept reading parenting books and come across the ones that spoke to me. The parenting book that caused me the most frustration was one of the first ones I read: BabyWise by Gary Ezzo. This is a popular book about sleep training for infants. I liked the idea of establishing a schedule, and I loved the idea of getting my baby to sleep through the night! But the author is so matter-of-fact, stating that if you follow his formula, your baby will nap and sleep through the night easily. There are many parts of this book that I think are correct and helpful. I believe in the Eat-Awake-Sleep routine. I used it for all four of my babies, and they all slept through the night within the first few months. However, the author is very rigid about sticking to the scheduled eating and sleeping times. Any veteran parent knows this is not realistic, but I was seduced by his claims and felt betrayed when I didn’t get the same results. Now I know parents have to adjust and be flexible with the baby’s needs and wants and the changing events of each day (doctor’s appointments, outings, etc.). I wanted to do everything “right” though, and couldn’t help but be frustrated when my baby’s behavior didn’t seem to conform to his examples. He talks about the nap cycle where the baby sleeps 45 minutes and then wakes, but can and will go back to sleep for another 45 minutes to an hour. In a general sense this is true; all my babies have exhibited this pattern and have learned to go back to sleep for the “second” portion of their nap. But day-to-day this was not always the case. When I had my first child and she wouldn’t go back to sleep, I let her cry for a while. But then I started scouring the book for the part about what if she doesn’t?! This was never addressed in the book. The author completely assumes the baby will do exactly what he predicts. As a new mother this left me terribly stressed! He really should have had a portion for what to do when the system doesn’t work! Anyway, there are a few other books out there that recommend this Eat-Awake-Sleep cycle, and many of them are less rigid and more forgiving, letting parents know that it doesn’t always work perfectly. One I particularly liked is Secrets of the Baby Whisperer. The author, Tracy Hogg, writes about really getting to know your baby and watching her cues, which I think is important. After my experience with BabyWise I read other parenting books with a little more skepticism. This is the only way to read them. Parenting books have to claim to have the magic answer in order to convince readers to buy them. But there is no magic answer, and most books simply have good ideas and some new insights (at best!). They can be helpful if you understand their limitations and don’t get frustrated when your children don’t respond exactly as they outlined. This book taught me appropriate expectations and changed my perspective on my role as a parent and my child’s needs. It teaches how to parent from a place of compassion and love, which was exactly what I was looking for. As my children grew from infants and toddlers to preschoolers and school age, I read Parenting with Love and Logic. This famous book by Foster Cline and Jim Fay is a no-nonsense approach to teaching children responsibility. This book is a must-read for parents, full of practical principles and advice. These authors encourage parents to be compassionate and empathetic with their children while being firm in their rules and consequences. Don’t get the idea that the whole book is written like that! That is just a quote from a different resource called the International Encyclopedia of Education. But he believes in that principle so much that he puts that quote at the end of every chapter! The first two chapters are very informative and interesting, and most of the rest of the book applies those principles to specific situations. The Parenting Breakthrough is one of my all-time favorite parenting books. Merrilee Browne Boyack is an LDS author who has written a few different parenting and marriage books. She is down-to-earth and humorous with straightforward and sensible advice. The first half of the book focuses on teaching your kids to work, save money, and be independent. The second half is full of strategies for building family unity. I was already doing many of her suggestions, but she explained how and why they were so meaningful. I highly recommend The Read-Aloud Handbook. Jim Trelease’s influential book on how and why to read out loud to your children is convincing and inspiring. The second half of the book is a long list (he calls it a treasury) of books suggestions to read aloud to your children, sorted by type and level. Nurture Shock by Po Bronson and Ashley Merryman is a fascinating book about recent research on children’s growth and development. This book has been called the Freakonomics of parenting books. It goes through some fascinating new science about children that goes against conventional wisdom. They make child development research accessible and enjoyable to read. There are chapters on speech development, self-control, teen rebellion, siblings and many more topics. I loved it! A dear friend of mine introduced me to the book The Blessing of a Skinned Knee. It is another amazing book full of realistic wisdom much needed for modern parenting. The author, Wendy Mogel, is a clinical psychologist who has counseled families for many years. She saw patterns in their struggles, and she realized that many of their problems stemmed largely from overparenting and coddling. She is also Jewish and applies wisdom from important Jewish teachings to parenting. Even though this may not sound like the typical parenting book, the format works really well, and the book contains some great information and advice. When your children reach the age of 9-12, you must read How to Hug a Porcupine by Julie Ross. It helps you navigate difficult tween behavior. You learn how to talk to your child about important issues, break the nagging cycle, treat your children with respect, and cultivate an increasingly mature relationship. Her approach is very compassionate and relationship-based, which I loved. There are other parenting books I’ve read throughout the years, but these are my stand-out favorites. I hope you read and enjoy some or all of them!